If you don't know your History, you don't know what you're talking about! I’ve been nominated for the #BookBlogAwards 2014. Vote for my blog on November 15th! ANOTHER AWARD FOR LITTLE MISS HISTORY! ICE AGE IN LOS ANGELES? Many children who live in the 21st century like to play a game in the pool called Marco Polo. The man who lived from 1254-1324 certainly knew a lot about water because he was born and raised in Venice. His father Niccolo and uncle Maffeo traveled world-wide as successful merchants. It appears that Marco did not even meet his father until he was a teenager because due to his father’s long absences from home. When Niccolo returned to Venice in 1270, he did not know that his wife had died nor that she had bore a son. Marco accompanied Niccolo when he left on the next business trip in 1272. The journey would take them to Jerusalem, Persia, Armenia, Turkey and the Mongolian Empire where Marco met Kublai Khan, the grandson of Genghis Khan. Few Europeans could imagine the palace of Kublai Khan who dressed in robes of silk and gold and lived in a building so large that 40,000 people could dine at the same time. Marco and he became good friends. Marco became an official royal messenger and tax collector for the Emperor traveling to Indonesia, India and Africa. He learned how to use native weapons like the bow and arrow, discovered how coal could be used for fuel, and used their paper currency for trade. Polo became fluent in the Mongolian language. His journals describe exotic animals like the rhinoceros, peacock and rhinoceros unknown to the Western world. The Emperor was generous to his people, but eventually a war with Japan caused unrest. Polo could not leave without the Emperor’s permission. When he finally returned to Venice at age 38, they were at war with Genoa. Polo was imprisoned. There he met another prisoner named Rustichello who encouraged him to record his world -wide journeys. By the time he got out of prison, Polo had inherited his father and uncle’s fortunes. Europe was about to enter the age of exploration. Sailors and cartographers based their calculations on his journals. Christopher Columbus decided to sail west to get to China discovering a new continent in the process. As you see, this concise biography is not written simply to explain one life but to show the influence and future consequences of his fascinating life. The editors say that the book is aimed at the 7-10 age group and I feel that they are on target. The illustrations help to visualize the textual descriptions and the maps give a flavor of the knowledge of the period. I believe that most of the information is accurate though there is a dearth of written documentation. Both children and adults can use this book as an introduction to a study of religions, trade and culture of regions not well known to the Western world in the thirteenth century. 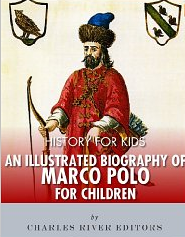 Children may have a better understanding of just what they mean when they say, “Marco….Polo” in the pool. If you enjoyed reading this post, please subscribe by clicking Follow or hitting the orange RSS feed button in the upper right hand corner.